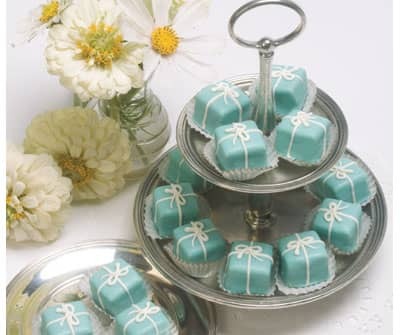 Try our Dainty Raspberry Creme petits fours finished just like that famous jewelers box we all love so much. Perfect to complete your special day. Dainty Raspberry Creme petits fours finished just like that famous jeweler's box we all love so much. Enrobed in a soft shade of robin's blue chocolate and decorated with ivory ribbons and bows. Available in gift boxes of 36 cakes.